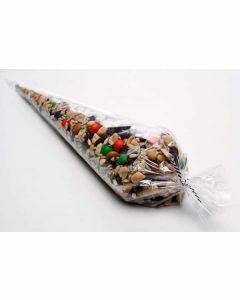 Presentation plays a key role in packaging, and that’s why ClearBags carries a variety of cone bags – cone shaped bags that are food safe and popular with treats, trail mixes, and more. These are our heavy duty laminated cone bags, made with thicker and more durable materials to handle the friction of the contents and handling from those that may be purchasing the bags. They come in several sizes and are far more secure than traditional cone bags. 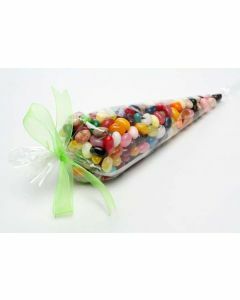 If you need durable, thick, and clear cone bags for your treat packaging, check out our inventory below.